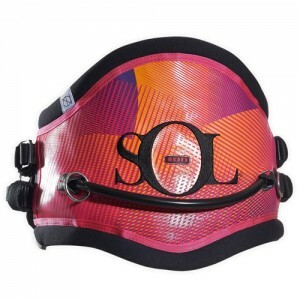 Women Freestyle harness with slim outline-cut for maximum flexibility; newly developed bar-webbing construction; inside protection with full neoprene cushion lets the harness also twist easily around the body when needed. Combining the contour shape and pre bent wrap tec the system guarantees a perfect fit to the body. - Hip protection: Foam padding to protect especially the pelvis bones if the body bends sideways.